Even though I’m a writer–maybe BECAUSE I’m a writer–I don’t usually blog about writing. 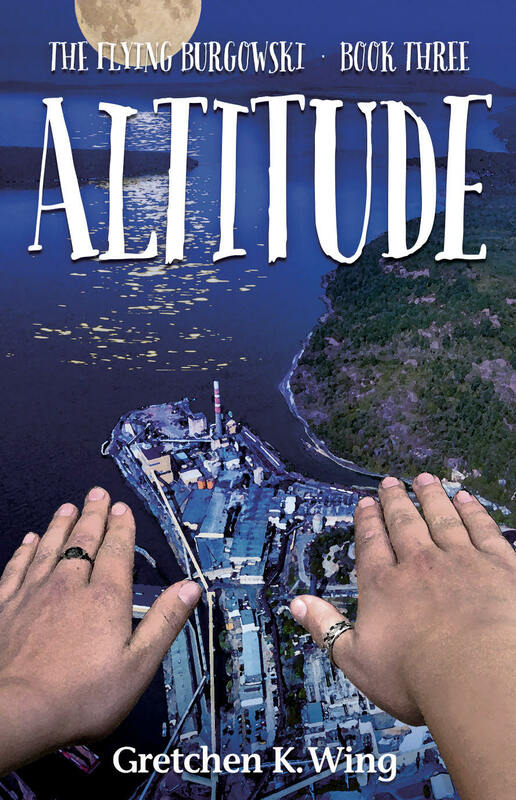 But when my friend and writing/publishing mentor Iris Graville invited me to take part in a Writing Processblog tour she joined through the Northwest Institute of Literary Arts MFA program, I was thrilled to say yes. What am I working on? 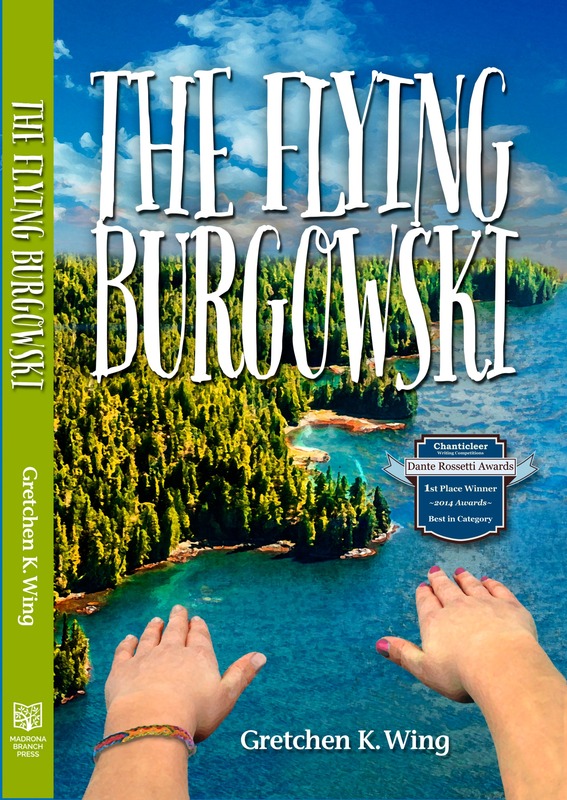 Having just published my first YA/tweens novel, The Flying Burgowski, earlier this year, I am dividing my writing time now between promotion & distribution (not very fulfilling) and finishing the final draft of the sequel, The Flying Burgowski Disaster (extremely fulfilling). Like thousands of other writers, I have learned in the past couple of years to quit whining about the challenges of independently publishing, a.k.a. taking responsibility for one’s own marketing and distribution. I’m still astounded at how a batch of phone calls and emails relating to author readings/book signings, or questions about consignment, can eat up an entire morning! But I try to stay grateful for the opportunity to do this at all. In the Brave New World of publishing, the Big Scary Gatekeepers have lost their power. Or, looked at another way: I am now my own big scary gatekeeper. Let’s just say I have learned a great deal, but have a long way to go before achieving my Masters in Gate-ology. I greatly admire authors who can build effective fantasy worlds. I lost myself in Tolkien’s and C.S. Lewis’s books at a young age, and I am a thoroughly unapologetic Potterhead. But I find more personal meaning and challenge in imagining how one might deal with magic in THIS world. Kids these days have some pretty awful issues to deal with, and so does my heroine. How does a superpower help or hinder the scaling of an obstacle like, for example, an alcoholic parent? That’s what I’m interested in. I should add here that Victoria Forester’s middle-grades novel, The Girl Who Could Fly, is nominally set in the real world. But that world is drawn with such exaggerated characters as to be nearly fantasy, in this writer’s opinion. The Flying Burgowski’s darkness is a more recognizable, straight-from-the-news-headlines kind of darkness. That said–it’s not a sad book! I promise it will make you laugh, no matter how old you are. How does my writing process work? First of all, I am extremely blessed in being able to write as my part-time “job,” (along with working part-time in a bakery), since walking away from my 20-year career as a high school teacher a few years ago. In those days I had to get up at five to write for 45 minutes before leaving for school. I hated that routine, but it did produce my first rough draft. Now my kids are grown and gone, and I am financially able to do what I want for the most part–a blessing for which I am unendingly grateful. Secondly, I am married to the most wonderful man, who created a Writing Barn for me. Well, it’s the upstairs half of a barn; he gets the downstairs for his shop. But up there I have a large, mostly empty space with cedar walls, a little decorative pottery, a toilet, a hot-water kettle for tea, and a beautiful (but not too dominating) view. Best of all: no internet! Therefore, no distractions. It is COLD up there, especially in the winter, and since I never write for longer than 4-5 hour chunks, it’s really not worth heating all that space with the wood stove, cozy as that sounds. 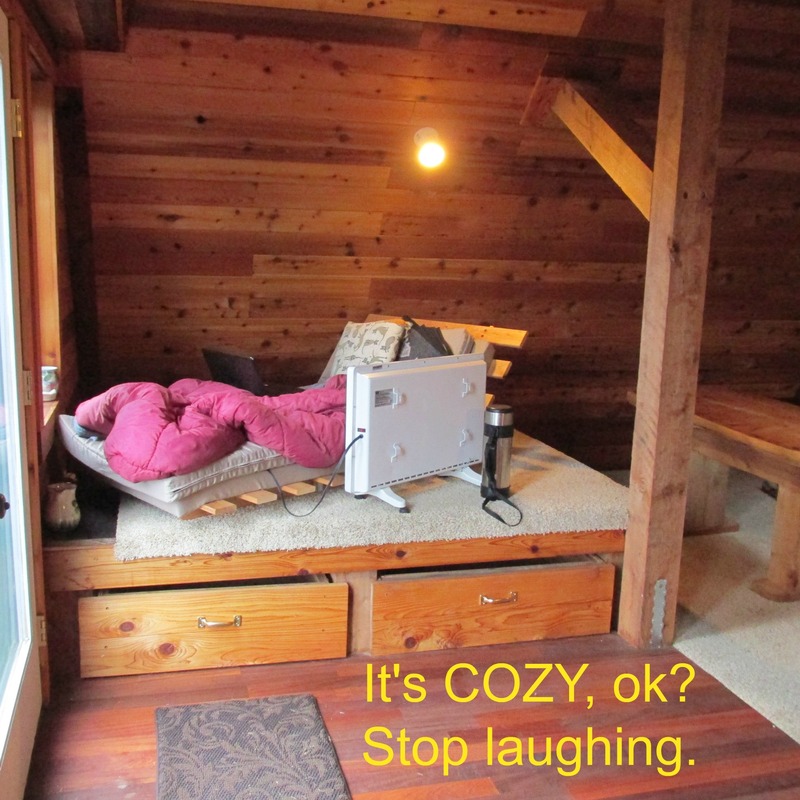 So I have a space heater on a timer, to pre-heat my writing spot, and…don’t laugh…I write in a sleeping bag. I’ve always written from a semi-lounge position on a bed or sofa, so the sleeping bag fits right in. I always start by reading aloud what I wrote the day before. Then I pick up from there. If I get stuck on an issue of plot or character development, I go back to my Outline page and just blah-blah-blah as though I were having a conversation with myself. Though it’s tempting to delete the blah-blah-blah from the outline after I’ve solved it, I leave it there as a reminder of my thinking process. It usually comes in handy thinking through the next snag. 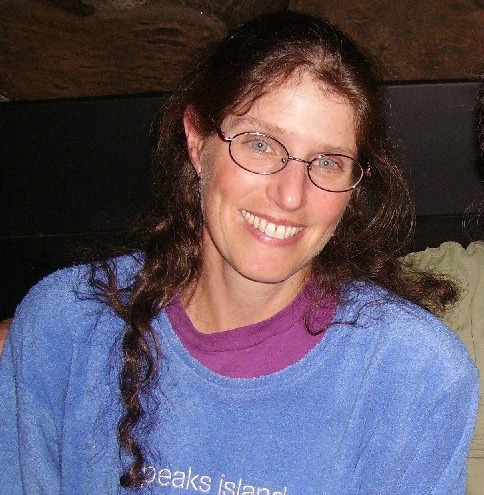 Next week the Writing Process Blog Tour continues with another writer I admire. 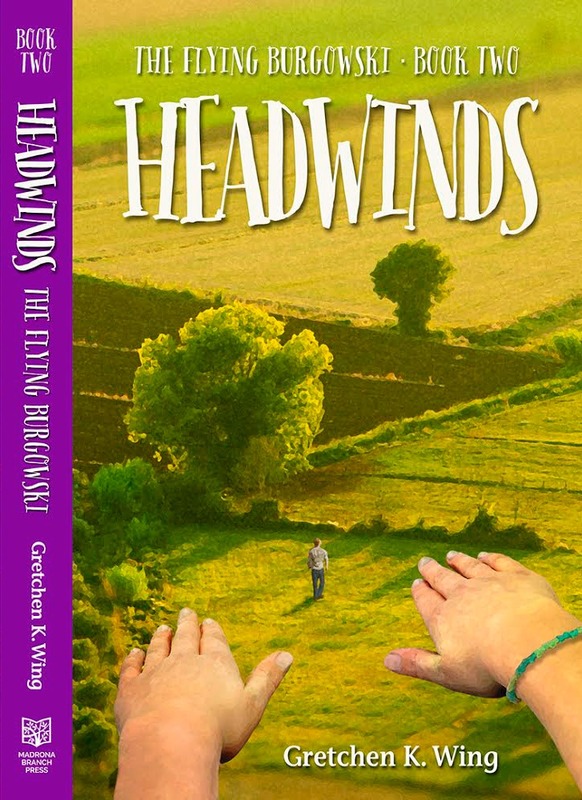 Shan Jeniah Burton lives a passionately playful life filled with lovely chaos, intertwined with her chef husband, two endlessly fascinating children who keep outgrowing their clothes, and a rotating cast of furry companions. She’s traveled the country, and counted among her backyards the Grand Canyon, Yellowstone, and the Everglades, only to settle on the same sleepy country road in upstate New York where she grew up. She is particularly fond of words and dreams, imagery and photography, nature, history, music, and fictional people with green blood and pointed ears. Please click here to go to Shan Jeniah’s blog, Lovely Chaos. But, as always, I love hearing from my own dear readers. Can you relate to my writing process? How does it compare with yours, or the one you hope to have someday?